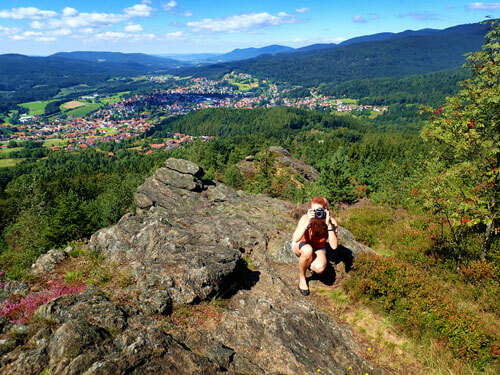 We visited the Bayerisher Wald (the Bavarian Forest) during late August, 2016 and spent half a week exploring the surrounding towns and the forest itself. The forest is the largest protected forest in continental Europe, so you can expect something a little different here. 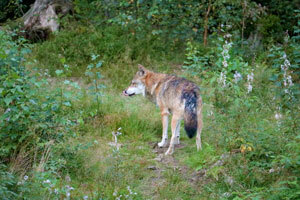 It is also home to some of Germany’s recovering wolf population. Read more here. 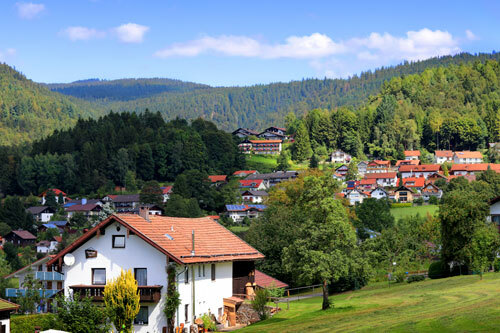 The Bayerischer Wald stretches along the German/Czech Republic border in the south east of Germany and covers over 240 square kilometres. Due to the huge expanse covered by the forest, there are a multitude of small towns that you could stay in while you explore the forest and its surrounds. We chose to stay in Regen for our time exploring the forest. It is about a 15 minute drive from the forest and big enough to have all the amenities for visitors. 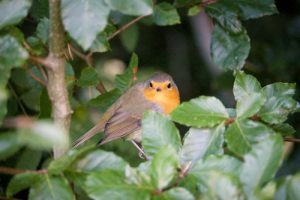 During the summer months we found that affordable accommodation in the area was hard to come by, so try to book at least a fortnight in advance. Aside from the castle ruins on the hilltop there isn’t a great deal to do in Regen, so having a full itinerary will come in handy. We arrived in Regen in the late afternoon and after enjoying the last of the warm summer sun, we decided to go and check out the forest just before sunset. 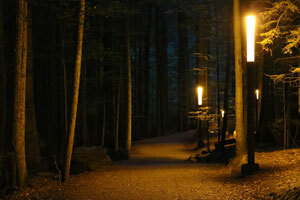 After arriving at the Falkenstein National Park Centre, we headed straight into the forest. After a 10 minute walk we stumbled upon a lookout tower and decided to get some photos as the sun set over the mountains. As the sunlight was fading we were getting ready to leave when we first heard the wolves howling. What an experience! It started off with a single wolf and within a few minutes there must have been 7 or more joining in. Luckily, they are fenced off, as they did sound quite hungry..
We ended up staying in the forest and watching the wolves until the last bit of light disappeared. Even though it meant we missed out on dinner the experience was well worthwhile, and we returned to the same spot the following evening for a repeat. This was certainly one of the most exhilarating things we have done on our travels. 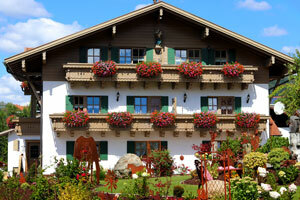 Bodenmais is 15 minute drive north of Regen and will keep visitors entertained year round. Firstly, the townships collective expertise is glassmaking, and there are plenty of traditional shops in the town where you can watch the professionals produce their beautiful works. You really cannot visit here and not include it in your itinerary. There is also a Kerzenwelt outlet here. Kerzenwelt translates to ‘Candle World’ and if you aren’t heading to Austria any time soon to see the original store, then make sure you stop by. The candles they produce are amazing and we are yet to see anything comparative in our travels around the world. 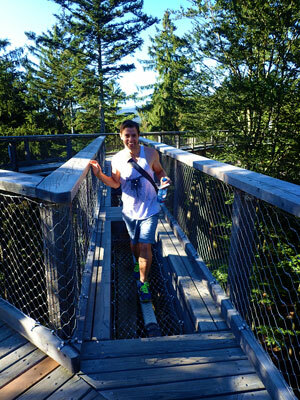 Being summer, the area also features plenty of hiking trails into the mountains. We hiked up a few short trails and were rewarded with amazing panoramic views of the region. For those heading to these parts in winter, there are plenty of ski fields in the area. 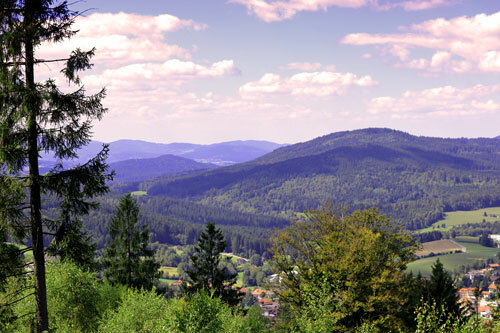 A short walk from the centre of Bodenmais is the Silberberg mountain. The mountain offers some of the best hiking in the area, as well as chairlifts and a beer garden on the ascent for those more interested in leisure. We hiked to the top and were rewarded with some amazing photos and views. To keep the kids, and some adults entertained, there are also toboggan rides back down the mountain. 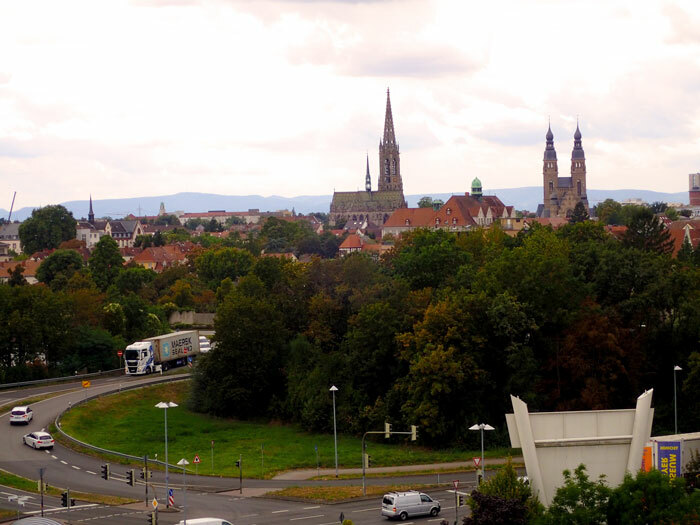 Right on the German and Czech Republic border is Lusen. 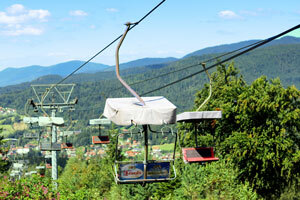 It is a mountain, not a town but has some great attractions for all ages. 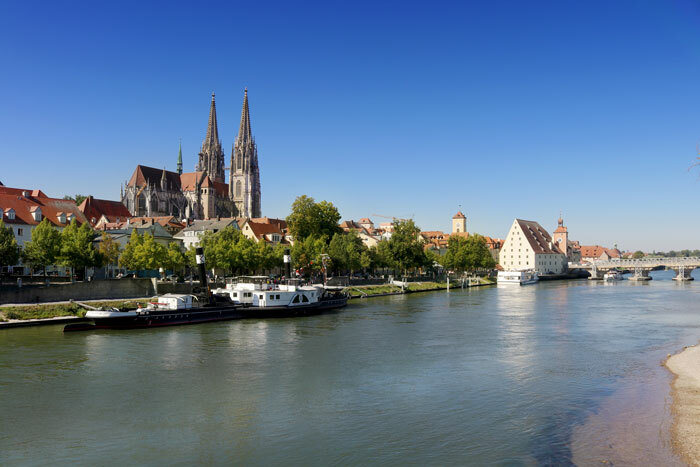 It is perfect for getting to know the natural side of Bavaria in all its beauty. It does require a moderate level of fitness and at least half a day of your time to take in all that is on offer. Any carbs you do burn can easily be replaced at the pub near the entrance. The premier attraction is the animal park. 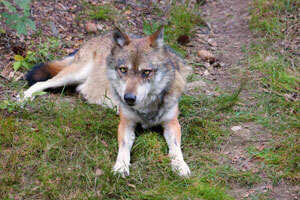 Featuring 30+ animals found in the forest including wolves, lynx and a brown bear. Aside from the big name carnivores, the animal park also features plenty of herbivores and birds. 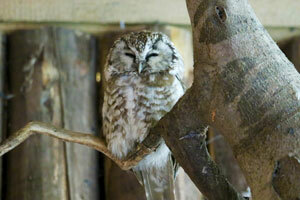 One of our favourite enclosures allowed you to share space with an adorable and friendly owl. 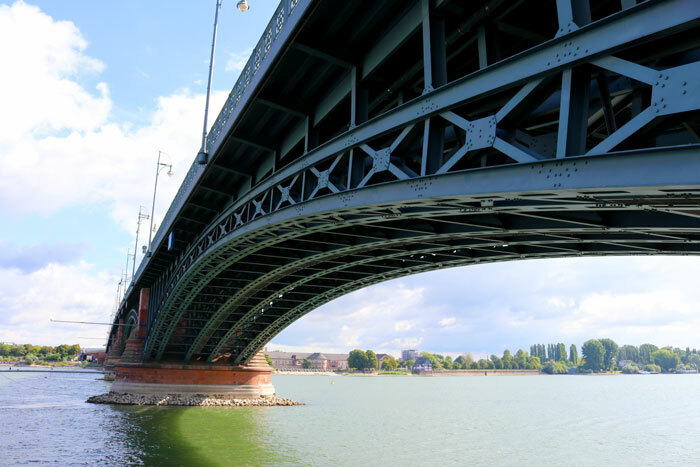 The park is quite large, so if you want to look and learn about all the German creatures then you will need more than 2 hours – but spending the time there was worthwhile. After exploring the animal park your legs are probably ready for a rest. Bad news, there is still plenty of walking to go. So grab a beer and prepare to soldier on. 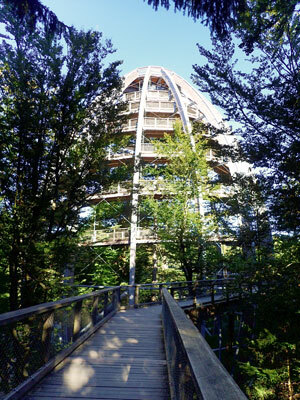 On the other side of the road is the treetop walkway. The cost of entry is 9€ per person. Walking 30 metres above the forest floor was great and there are plenty of excellent photography opportunities. If you’re lucky like us, native squirrels might come out to play. See their website for details. 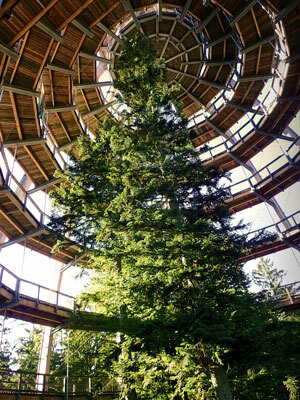 The walk ends at a massive lookout tower which can only be described as a giant pine cone. Whilst it is somewhat arduous walking around in circles to reach the top, it provides great panoramic views of the area – perfect for photographers of all abilities. Their website has some great information on how to reach the park, see here. Aside from the amazing animal parks and natural experiences to be had, there is also abundance of beautiful lakes and mountains to explore around the forest. The area truly is something special for those who enjoy the outdoors. In hindsight, it would have been the perfect place to camp for a few nights rather than stay in a hotel to really complement the natural experience.